French jeweler Mauboussin will launch Aequalis, a new fragrance for men, next month. Mauboussin has decided to celebrate “Moi non plus“ bracelet shine through its latest creation: Aequalis. A new perfume for men who move forward, driven by strength and belief. A fresh and woody eau de parfum with a duet of lemon and rosemary top notes. The iris note at the heart mingles with the warm and sensual scent of tonka beans, cedar and sandalwood. Aequalis was developed by perfumer Karine Dubreuil. 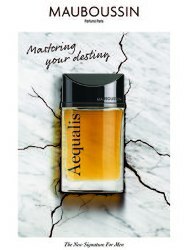 Mauboussin Aequalis will be available in 90 ml Eau de Parfum.